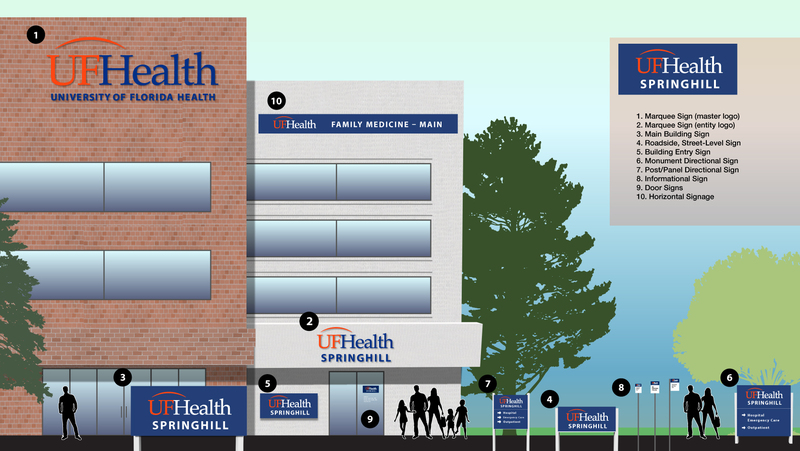 It is important to have a solid, cohesive approach to our external and internal signage in an effort to create a strong brand identity for the academic health center under the UF Health umbrella. The UF Health brand has established recognition and equity in the marketplace, and it serves as a visual cue and reminder to our patients and customers that the facility they’re in is part of a trustworthy, credible and hospitable institution. A standard package of signs provides an opportunity to visually reinforce the overall presence and strength of the UF Health identity system. UF Health signs should consistently and cohesively reflect, as much as possible, our brand and the approved elements that make up our brand. Signs should use appropriate UF Health logo(s) and approved facility names, as well as be consistent in the presentation of these elements. Our UF Health brand identity standards are found in the menu items to the left. The purpose of this information is to provide standards for a variety of sign types. We recognize that some signs will have parameters and limitations that may require deviations or departure from the standards set forth in this manual. However, these standards must be followed in all other cases. When possible, ensure that all sign lettering, including the logo, has an edge clearance equal to the width of the “F” in UF Health. Sign manufactures may request an approved logo for sign use here. It is permissible in certain scenarios to add wording and other colors to signs when warranted per code and/or patient recognition. For example, the standard blue/white “H” for hospital, or red “Emergency” lettering may be attached to UF Health signs so long as there is a clear and visual distinction between those custom deviants and the UF Health logo/wording. Other approved logo color variations may be used, but the fonts and size ratio of lettering must adhere to the guidelines. When using solid blue or orange, please match to PMS 287 (blue) and PMS 172 (orange). It is important to use color combinations that make sense and allow for maximum visibility and readability. Here are logo set-ups to avoid. In scenarios where a landlord or other external factor warrants a specific color for signs and/or lettering, please ensure that approved fonts are used for the lettering. In scenarios where only one font can be used, the preference is to use our approved sans serif font (myriad pro bold). Other directional wording on signs, such as “Entrance” or “Parking” should be set in myriad pro bold or Helvetica (an international standard) unless otherwise dictated by codes or other guidelines. At times, wayfinding instructions like “Parking” or “Enter Here” can be the dominant wording on signs so that our patients can easily find their way. Typically, these types of signs will be visible after a patient has encountered the main facility sign. 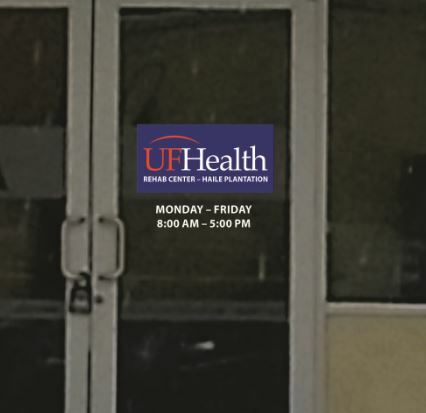 Given that many of our interior and exterior signs will need to be seen from a distance and (for exterior signs) as motorists are passing by at a high rate of speed, it is acceptable to enlarge the name of the facility beneath the UF Health logo for visibility and legibility. The size of the lettering should be dictated by the size of the sign and how much space it can accommodate. The UF Health logo should always be the dominant element on any sign and should always precede the approved name of the facility. Exceptions must be approved by UF Health Communications. Our sign manufactures and graphic designers have templates for the word/line spacing and letter tracking. When creating a new sign, these templates must be used to ensure consistency. It is generally NOT preferable to outline—in white, for example—the letters in a sign, especially when using an approved logo. In scenarios where outlining is necessary for visibility, framing or lighting, use the minimum outlining width necessary, with the most understated color possible, or, if possible, the same color as the lettering. In general, colors that deviate from our identity standards should NOT be used on signs and lettering, unless approved by UF Health Communications. In general, background colors for signs should, when possible, adhere to our identity standards. Blue (PMS 287), orange (PMS 172) white and black are the preferred background colors. Screens of these colors may also be used if the scenario calls for a softer, lighter color. When back or front lighting is used to illuminate a sign, white light, versus colored light, is preferred. When illuminating signs from within the lettering, ensure that the light allows for the best representation of our approved orange (PMS 172) and blue (PMS 287). Ensure that no hotspots or shadows are created when lighting a sign. Signs come in all shapes and sizes and are installed in various environments using various materials. Additionally, at times signs need to comport with city/county code restrictions and/or architectural mandates. Despite these various parameters, materials should be used that best allow the depiction of the UF Health brand in accordance with these guidelines. It may also be necessary to negotiate with landlords and/or city/county officials to arrive at a sign that most comports with these guidelines. It would be impossible to address every possible parameter for sign materials and installations, but representatives from UF Health Communications and UF Health Facilities are available to meet and assist you with the development and approval process. Lettering and sign finishes must not compromise the integrity of the UF Health brand. Glossy and reflective materials must still allow for an accurate representation of colors and fonts. All UF Health signs should be reviewed and approved by the Director of Marketing and the Director of Creative Services for UF Health Communications for visual accuracy and appropriate wording. The standard review and approval time is typically one week. If a sign is for a single entity/service, the UF Health logo, without descriptor, will appear along with the approved specific entity/service name. Refrain from printing actual names of physicians on signs and doors. These become costly to replace should a physician relocate or leave UF Health. As a general rule, a roadside sign for a particular facility or group of facilities shall contain the locator descriptor as per our naming conventions (E.g. UF Family Medicine – Main). However, the building/door signs do not need to use the locator. For interior signs, the master brand logo shall be used on all directory signs, but does not need to appear on directional signs. Directory signs contain multiple listings of the clinics/entities within a particular facility. Directional signs depict routes a customer must take to reach a particular destination. If a sign is for multiple entities/services, the UF Health master logo will appear with approved specific entities/services names beneath it. The “bridge” in the UF Health logo is not to be used as a separate and distinct design element in any signs. The sign family image below depicts examples of signage and is meant to serve as a visual guide for sign manufacturers.